While the transfer window is of great importance to Clarets boss Sean Dyche, developing his current group of players is just as vital. Dyche accepts Burnley will probably have to again break barriers in the market, and exceed the £32m they spent over the season, on the way to retaining their Premier League status. Can you keep it, and the players moving forward? 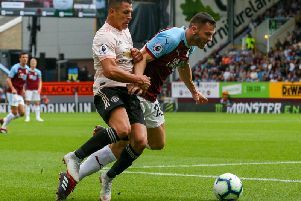 But while transfer dealings can make or break a manager’s reputation in the modern game, Dyche also believes in-house competition can help push players forward. He constantly assesses the players already at his disposal, with some contract decisions to be made. Michael Keane is unlikely to sign a new deal, with a year remaining on his contract - he is expected to move for a club record fee, with Everton leading the race, or even see out his time and leave on a free next summer. Andre Gray also has a year remaining, while George Boyd and Paul Robinson are out of contract and have new terms on the table. Dyche said: “It’s the shifting sands of football. Players move forward, it’s who continually fits, who goes out, who comes in? “They’re different things that have to be monitored and achieved. “That’s why the year on year of building, with the points we got, although we won’t be judged on that, it’s a good judgement for us in-house because that development is really important. “Can you keep moving it forward and keep the players moving forward? I find good value in that. All that thinking as regards players’ situations comes on top of having to get results, and Dyche admits: “I’m always stunned with the weight put on these managers. “It’s year on year year and layer upon layer of contracts, new players, coming in and going out, staff changes, fan requirements, shareholders. “The only thing people really bother with is the pitch and winning the next game. The off-field business is very time-consuming: “It’s ongoing. Fans often get on managers but if they knew the amount of work that goes in I think they will be really, really surprised. “Some clubs now have built these systems where they’ll have a version of this, out and out owner at the top, CEO, day to day, from the CEO, sporting director, scouting and recruitment, youth system, first team - that has changed the role of the manager to purely managing the team. “At a club like this, its managing a lot of different things, and there are versions of me managing a lot of things out there, but some of the super power concerns are just managing the team.